I think we’ve always had that special connection with the ocean and its creatures. 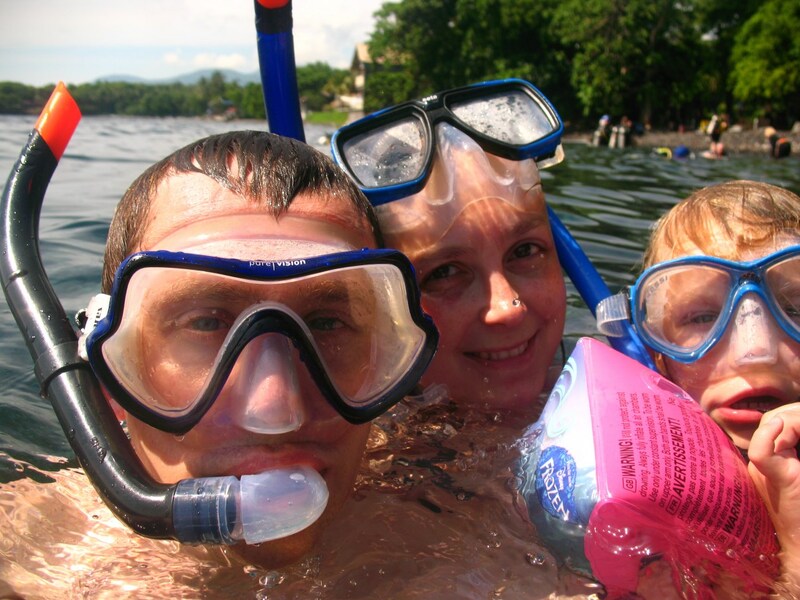 Annick loves a good swim, whether in the ocean, a lake or a river, and for her it is one of the best ways to fully relax. 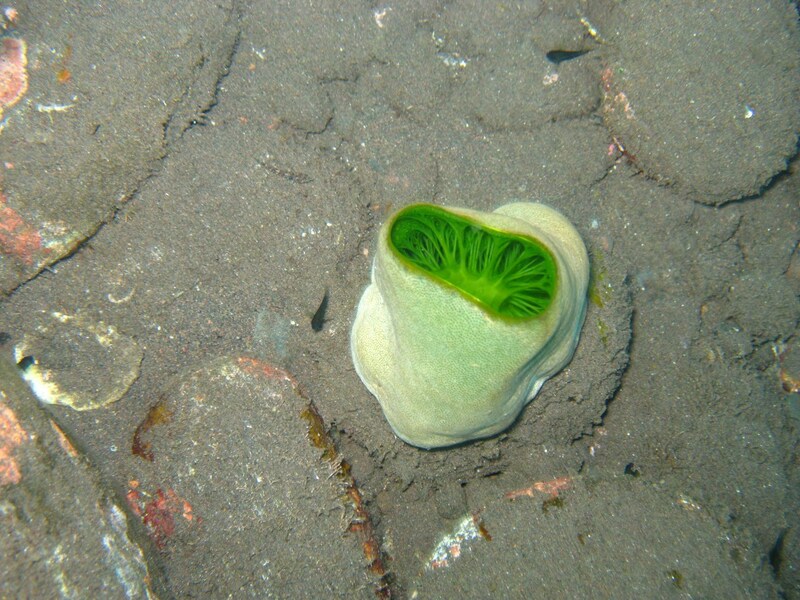 As a marine biologist, Maarten has also worked for years in close connection with the sea. Needless to say that we were particularly delighted to notice that Febe has also turned into a (salt) water lover. I remember how she loved to dip into the Mediterranean when she was 3, and last year she even went on her first whale safari in South Africa with us. She loved it, didn’t complain at all of sea sickness and was also very patient, even though the whales were playing hide and seek that day. Her parents (that’s us!) 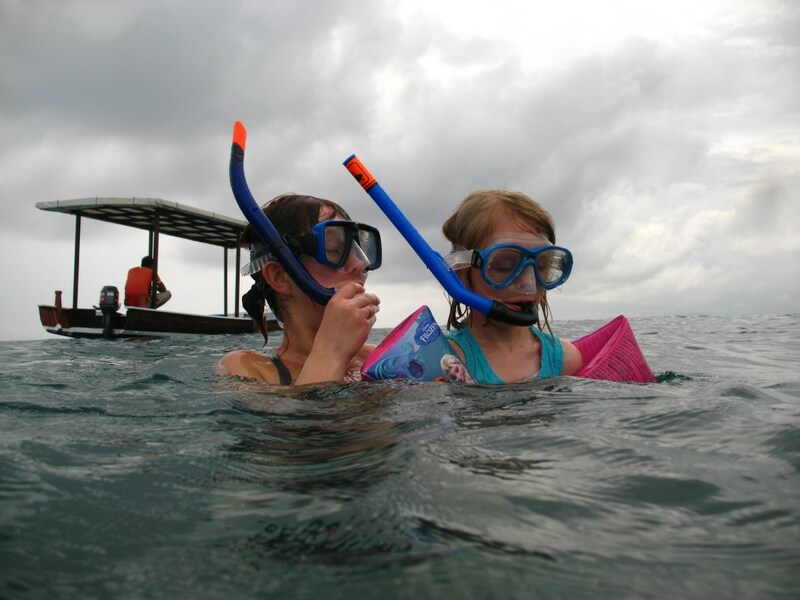 do have a bit of snorkeling experience already, with some memorable sessions in the Red Sea (Annick), off the coast of East Africa (Maarten), in Guadeloupe and the Dominican Republic (together). However, the first one with Febe was a real challenge, and something we both were looking forward to! Pemuteran is a village in the northwest of Bali. 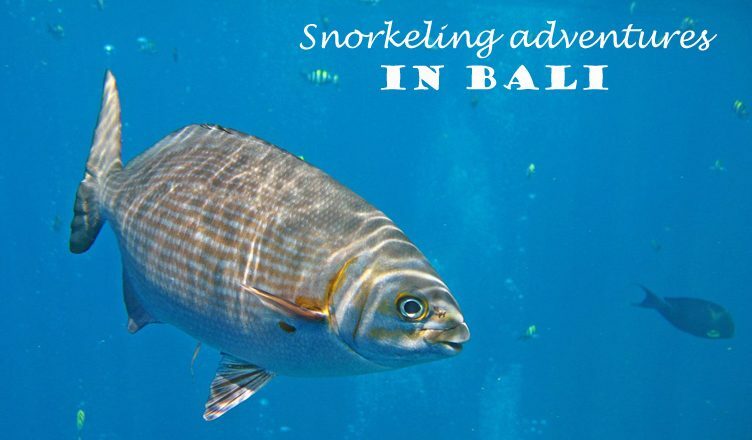 It is the starting point for excursions to the Bali Barat National Park (known for the Bali Myna, a rare indigenous bird species) and Menjangan Island, a paradise for snorkelers. 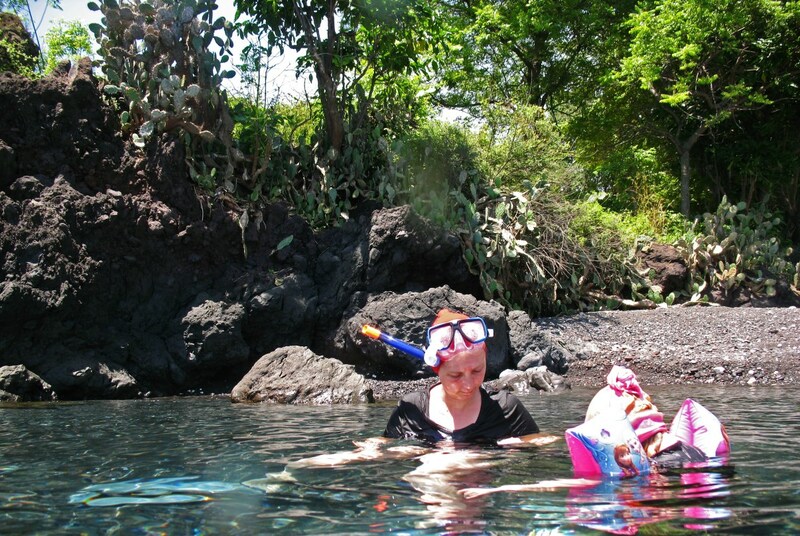 However, if you don’t feel like going on a day trip and you just want to do some laid-back snorkeling close to the beach, there are some good options nearby as well. 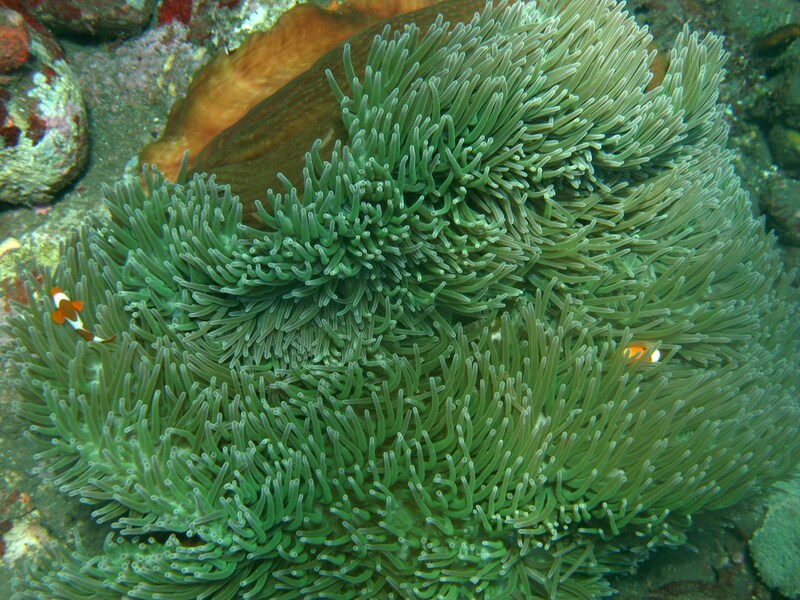 Since 2000, more than 60 coral nursery structures have been installed in the marine protected area that is situated just a short distance from the beach at Pemuteran. 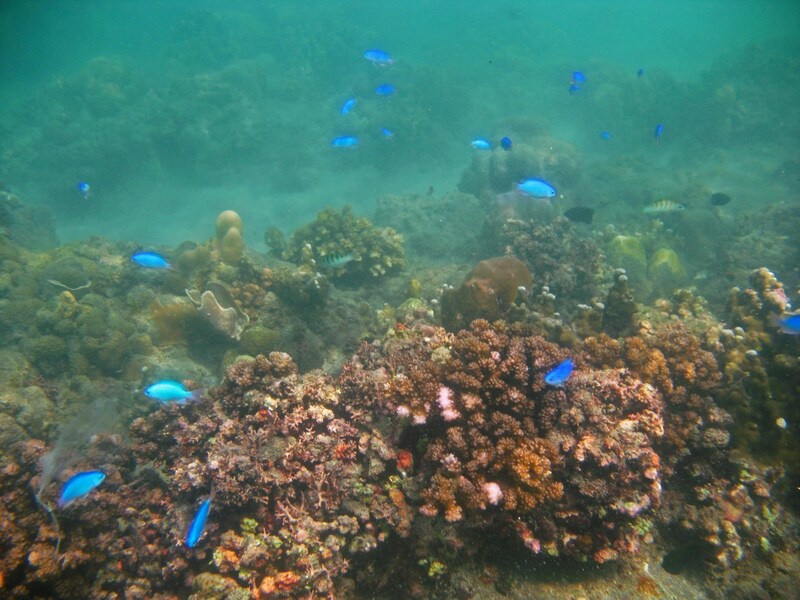 The “Bio-Rock” project attempts to restore the shallow reef that has been largely destroyed as the result of fishery activities and by doing so it has created biodiversity hotspots that attract a lot of fish and other marine life. 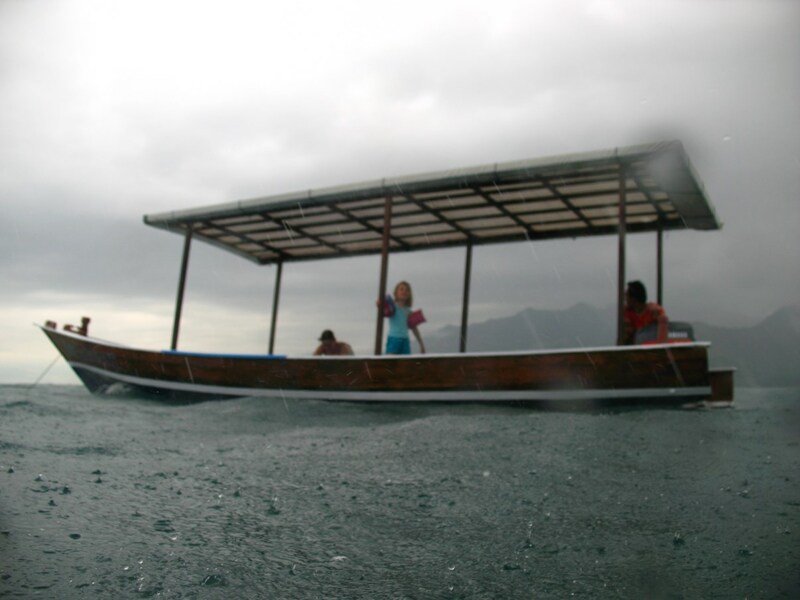 When we arrived at Pemuteran, conditions were not optimal, to say the least: since it was the beginning of April there was still a lot of wind, rain and thunderstorms. 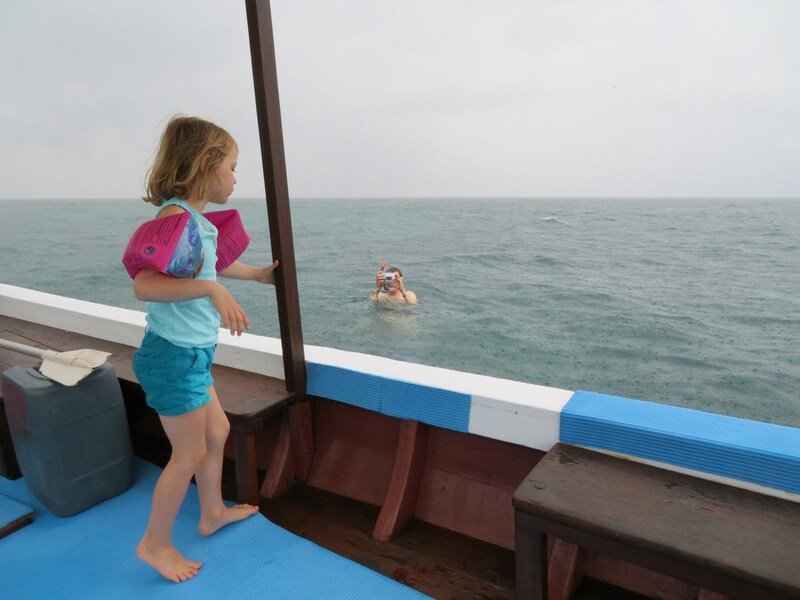 We had booked a day trip to Menjangan Island with Reef Seen, an eco-friendly divers’ resort annex turtle hatchery, but when we arrived there the next morning, we were told the sea was much too rough for the boat to sail out. 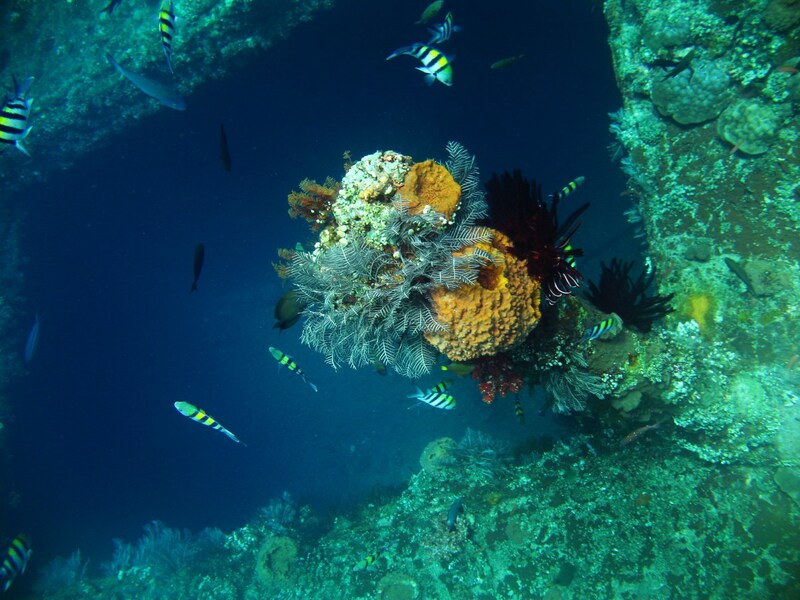 Although pretty disappointed, we decided not to get too disheartened , so we agreed on a short snorkeling session over some Biorock reefs (called “Close Encounters” and “Bio-Wreck”), only 10 minutes from Reef Seen by boat. Needle fish at the “Bio-Wreck”. At first, Febe was very reluctant to go into the water. To be honest, without the sun and with all that rain, visibility was very low, so diving in really didn’t seem all that appealing to either of us. We took turns going in the water (one of us stayed in the boat with Febe). 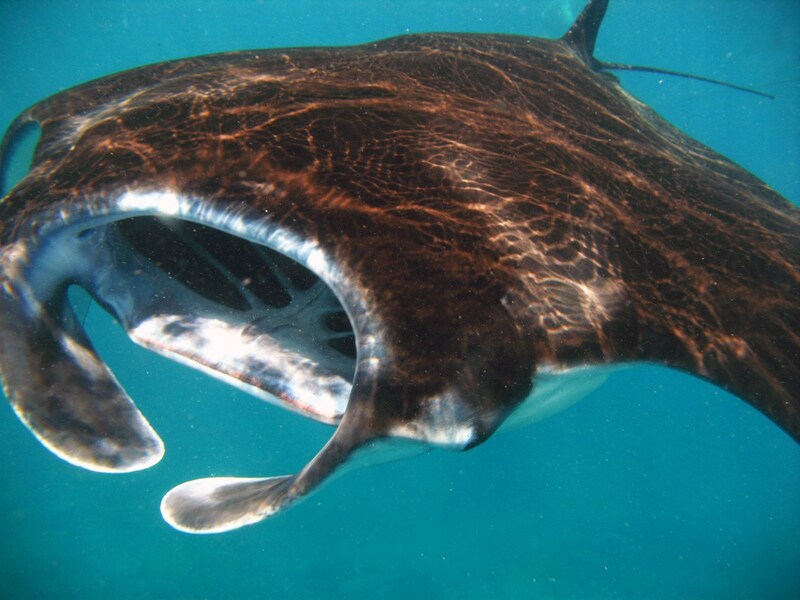 I was snorkeling over “Bio-Wreck”, our second spot, when suddenly both Annick and Febe were swimming next to me! 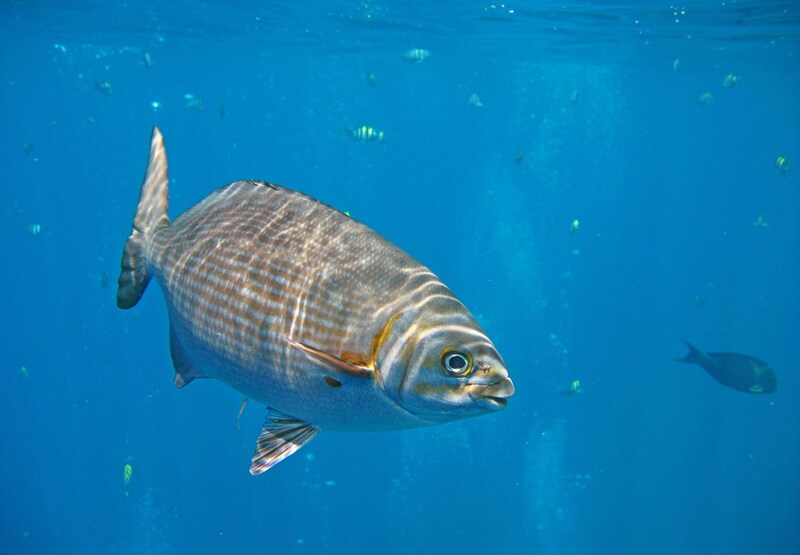 Annick had successfully convinced Febe to have a look underwater because there were so many colourful fish below. She finally did it! 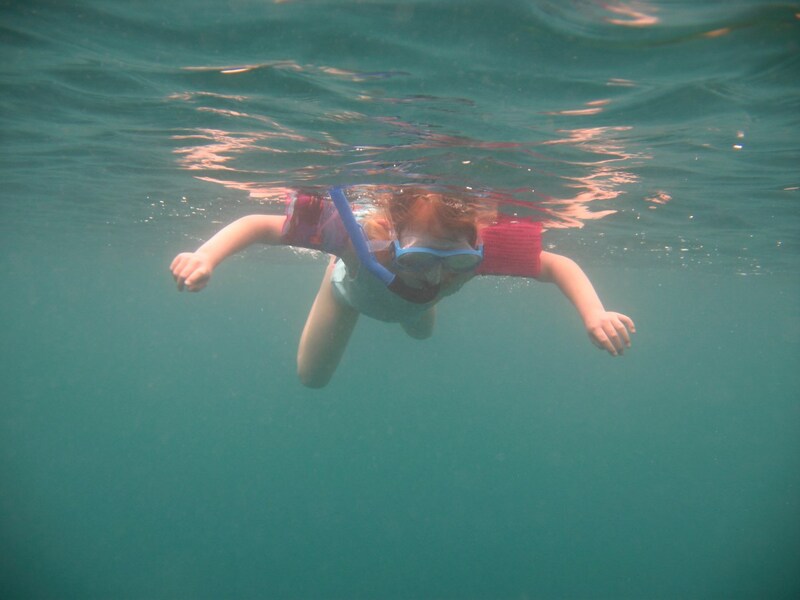 So this turned out to be a memorable day after all: Febe’s first salt-water snorkeling experience! 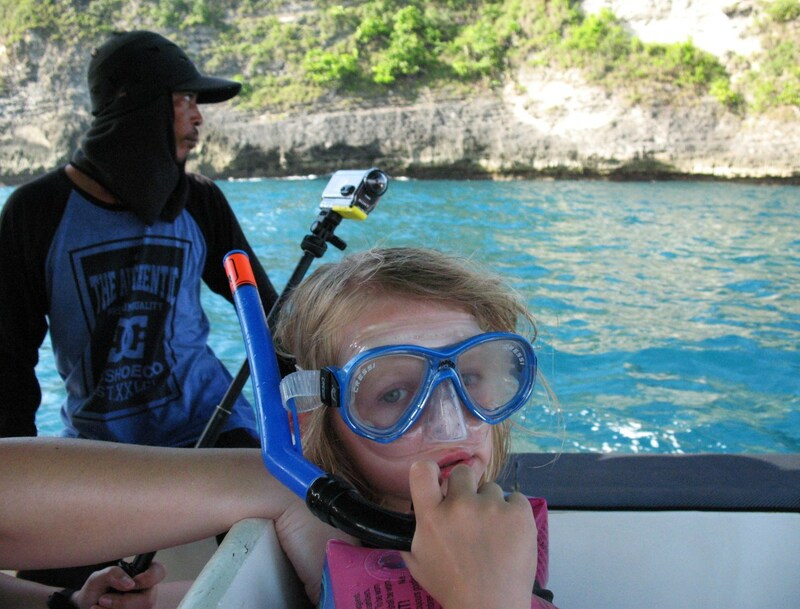 Tulamben and Amed are two villages on the eastern coast of Bali that are very popular with divers ànd snorkelers. 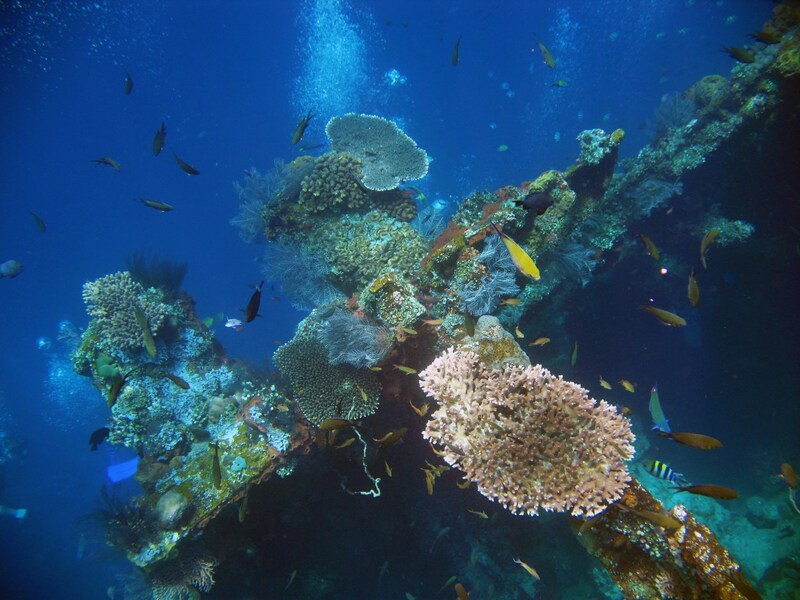 Greatly adding to their popularity are a few shipwrecks close to the coast, of which the USAT Liberty, a USA army cargo ship torpedoed by a Japanese submarine in 1942, is the most impressive. After being stranded on the beach for many years, the wreck was finally pushed back into the sea by a volcanic eruption in 1963. 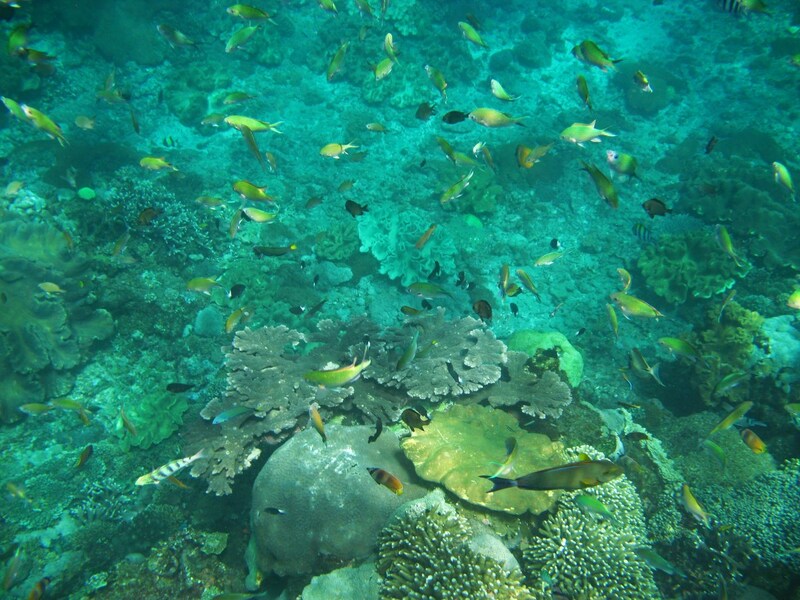 Located just 25m from shore, and at a depth between 5-30m, it is accessible even for snorkelers! And what an unforgettable spot this was!! 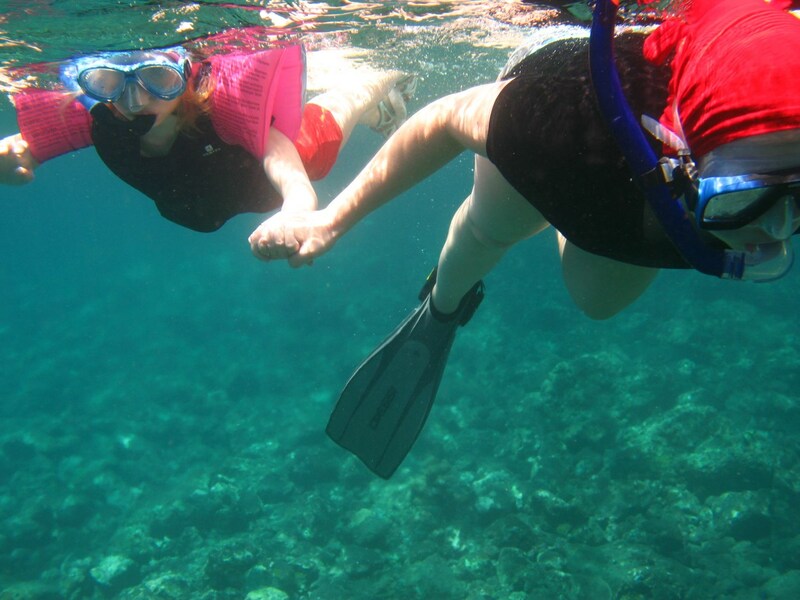 We must have said “Wow!” a thousand times through our snorkeling tuba. 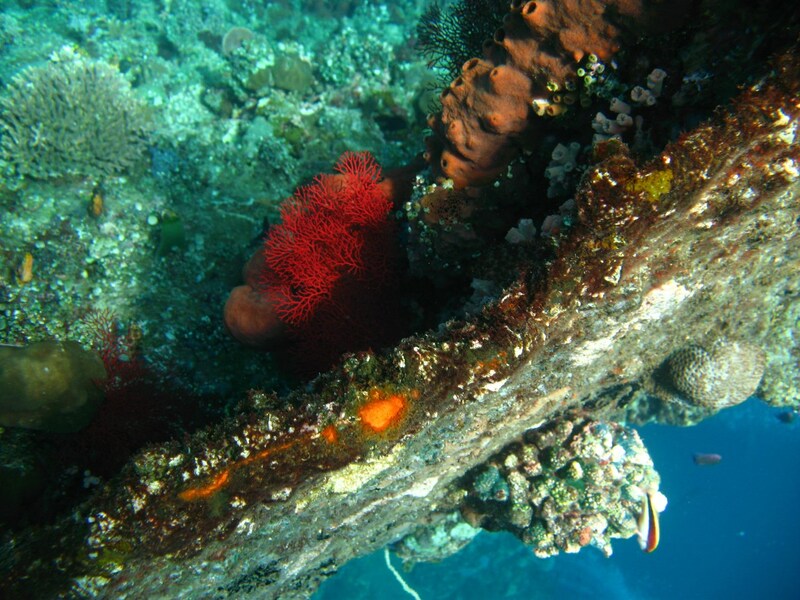 Such a large wreck with so many fish, colourful corals… Really impressive, especially because it was so tangibly close! 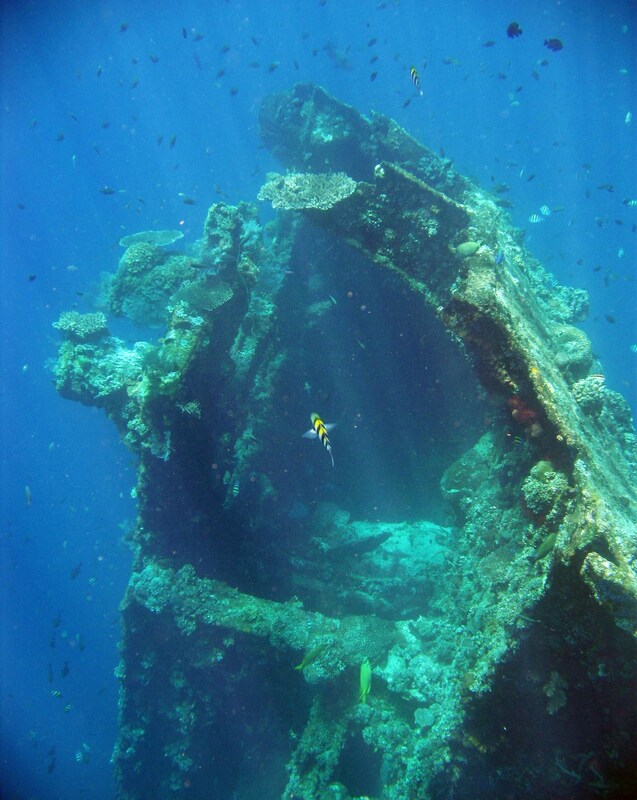 The wreck, such a large mass in the deep water. A gathering of fish near the wreck. 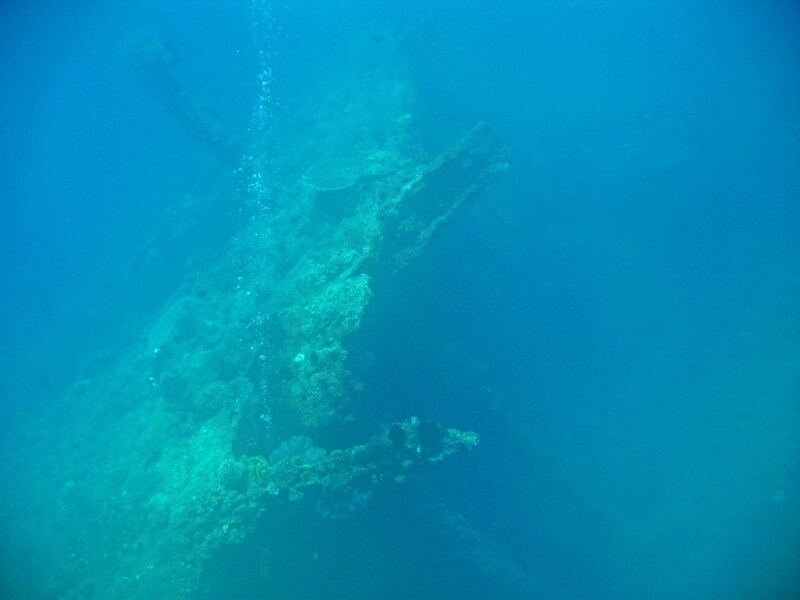 To reach the wreck from our beachside hotel, we had to snorkel some 100m or so over an area with a very high biodiversity. 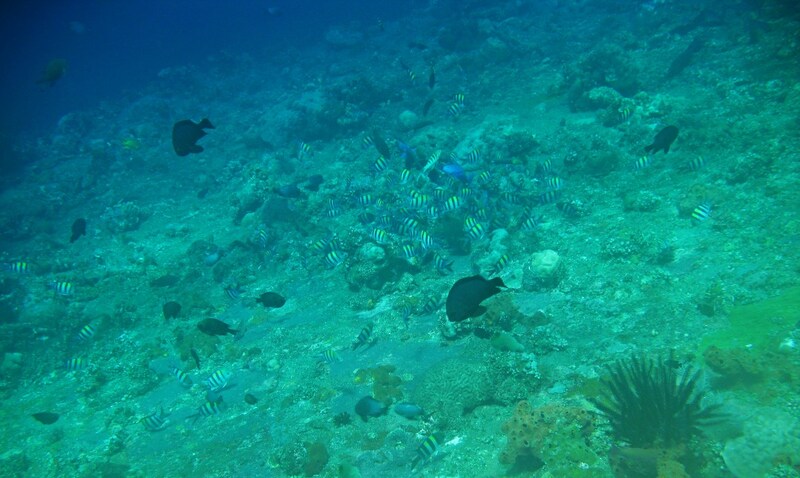 Febe’s highlight was definitely seeing Disney’s Nemo (Clownfish) and Dory (Blue Surgeonfish ) in real life. 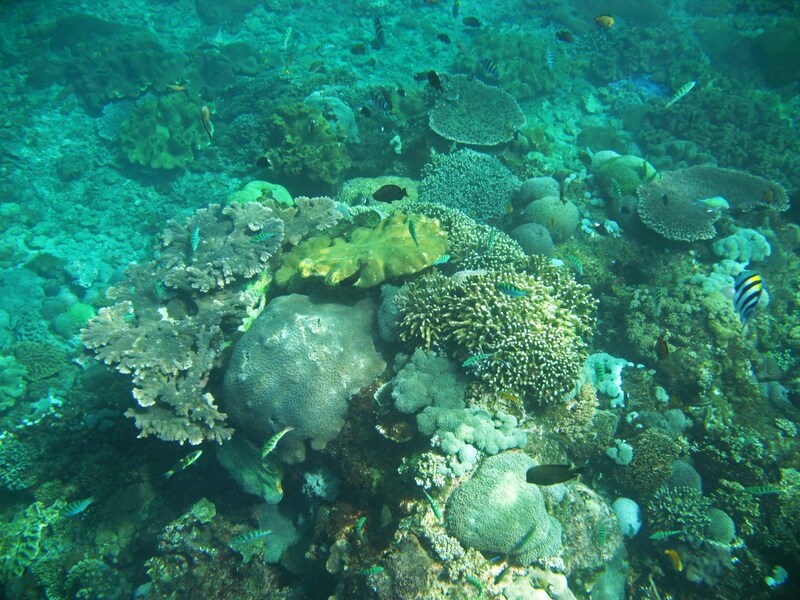 Also saw a few Bumphead Parrotfish, but wasn’t able to take any good photos. 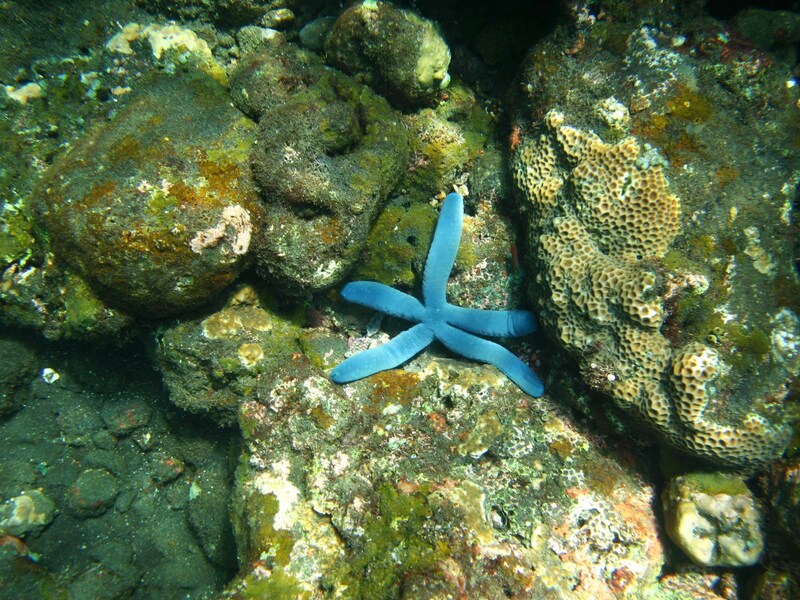 Blue sea star (Linckia laevigata). 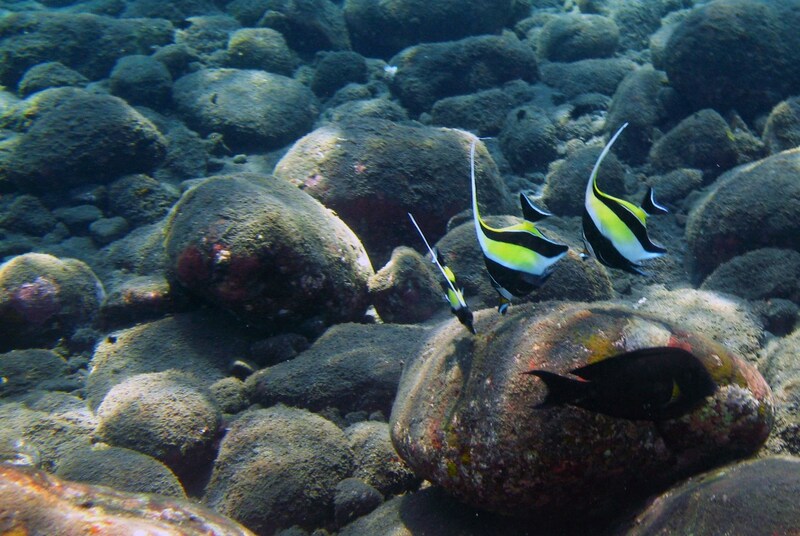 Three black and yellow Angel Fish foraging. 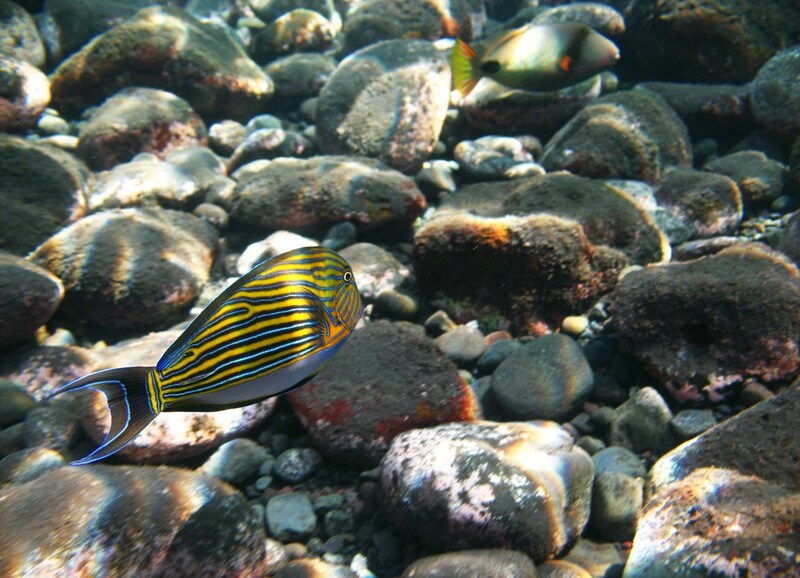 Blue Banded Surgeonfish (Acanthurus lineatus). 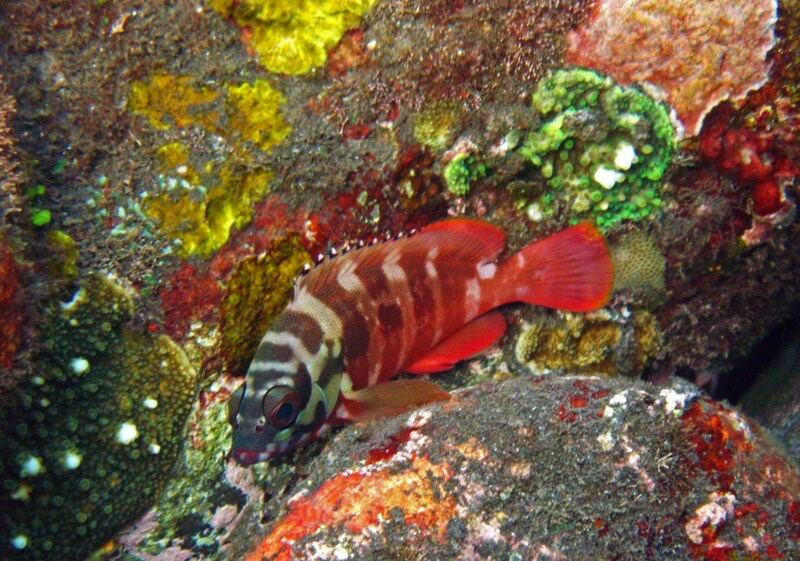 Beautiful red fish (no idea which species this is). 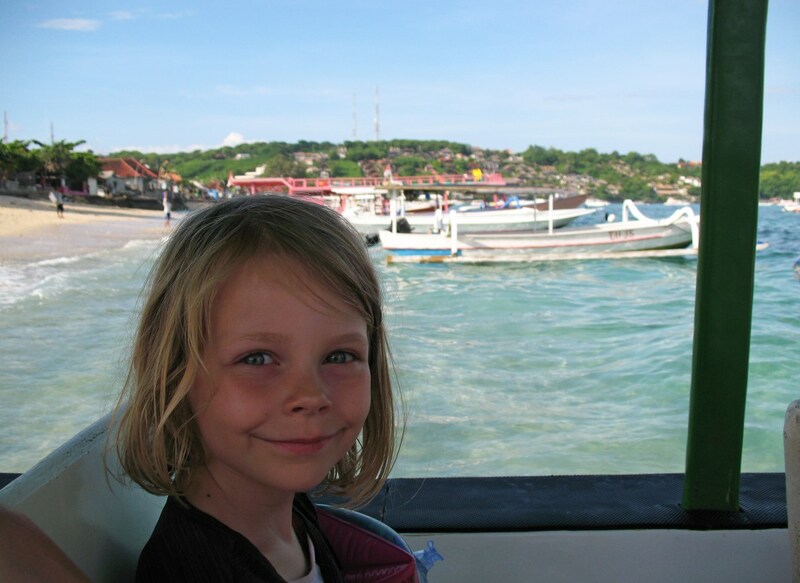 The small island of Nusa Lembongan is just a 45min, bumpy, “ferry” (just another speedboat) ride away from Sanur, so we decided to leave Bali for two days. 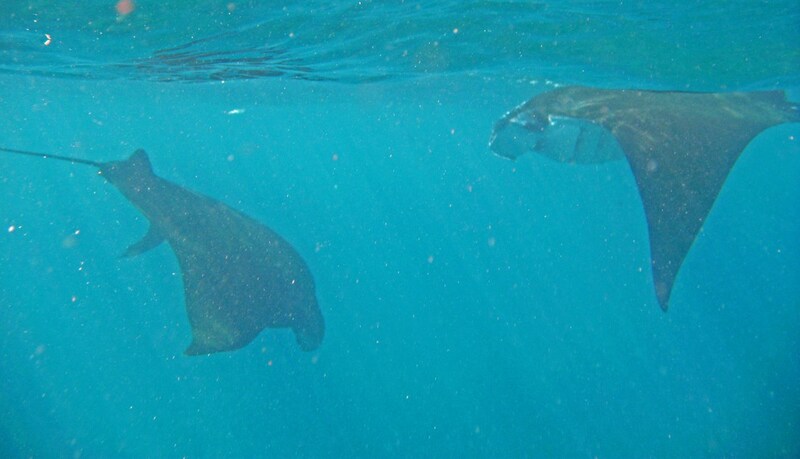 Our objective: to go snorkeling with manta rays! We were staying at D&B Bungalows, whose owner, Diasa, is a diving instructor who offers diving and snorkeling tours for a very fair price. What appealed to us the most was Diasa’s positive attitude and his dedication to the animals and their environment. And the price of course. Febe was really excited to go on this adventure. 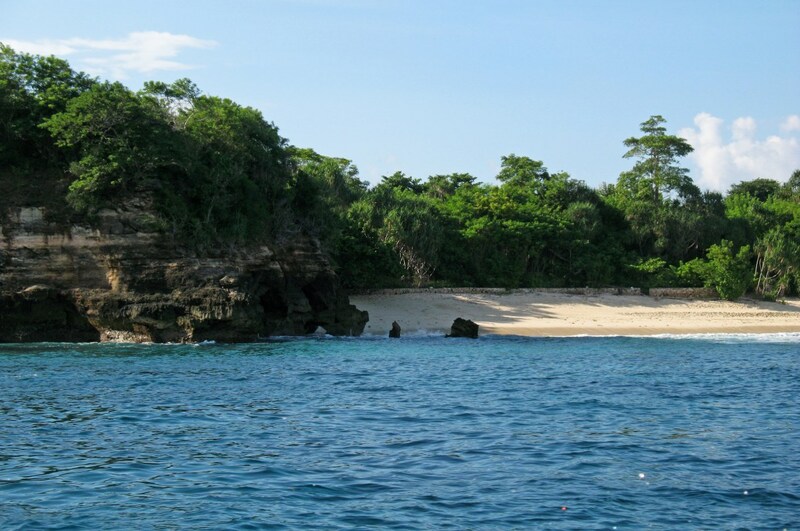 The coast of Nusa Lembongan: very idyllic. Gear on, ready to jump in! 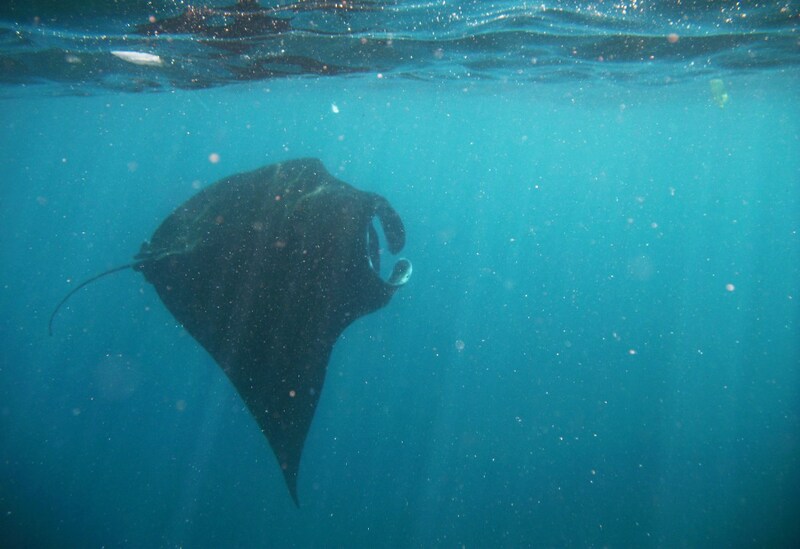 During our swim at the second manta location, the animals seemed to be much more at ease with our presence. They swam towards us, passed closely underneath our floating bodies, then turned and repeated this ritual time after time after time. It was magical and they were so close we could easily have touched them (which we didn’t, since that would stress them out). Pure bliss in those moments! 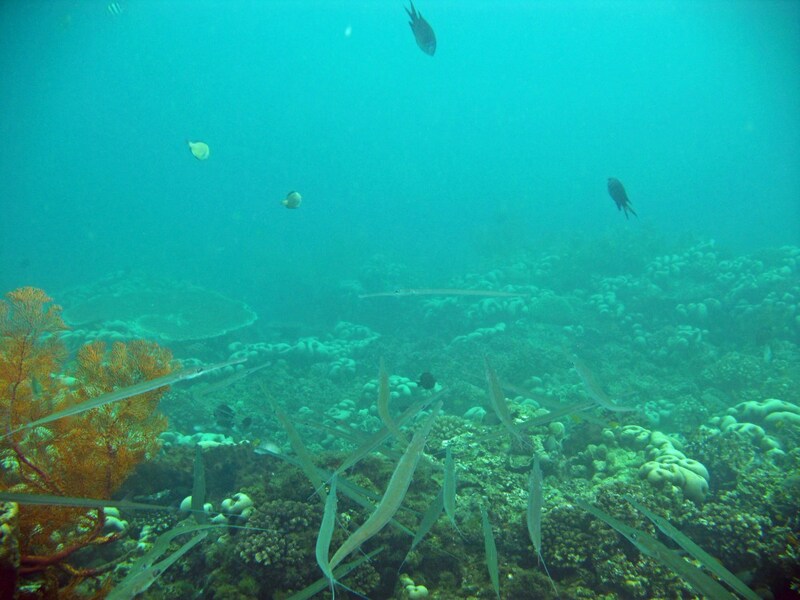 After our adventure with the mantas we also visited Crystal Bay, a shallow reef spot with an incredible density of fish. 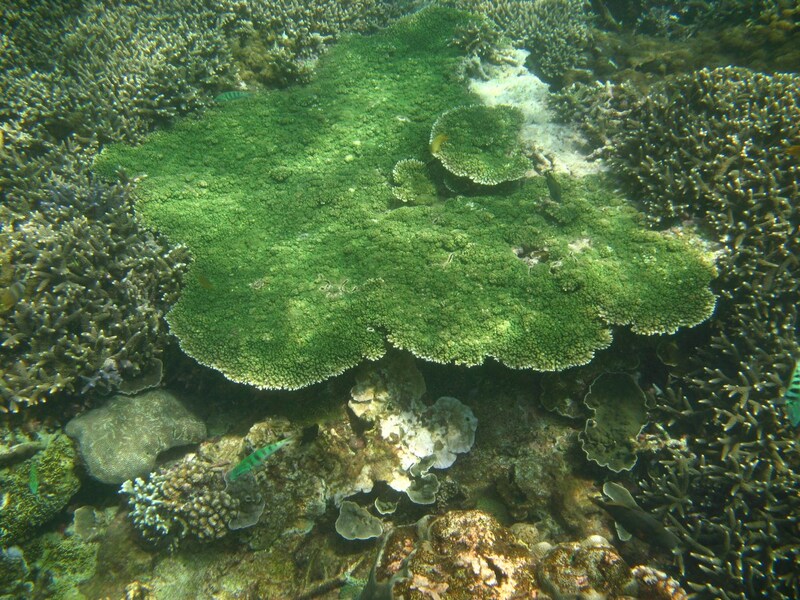 Our final stop was Mangrove Point, a lush coral garden. 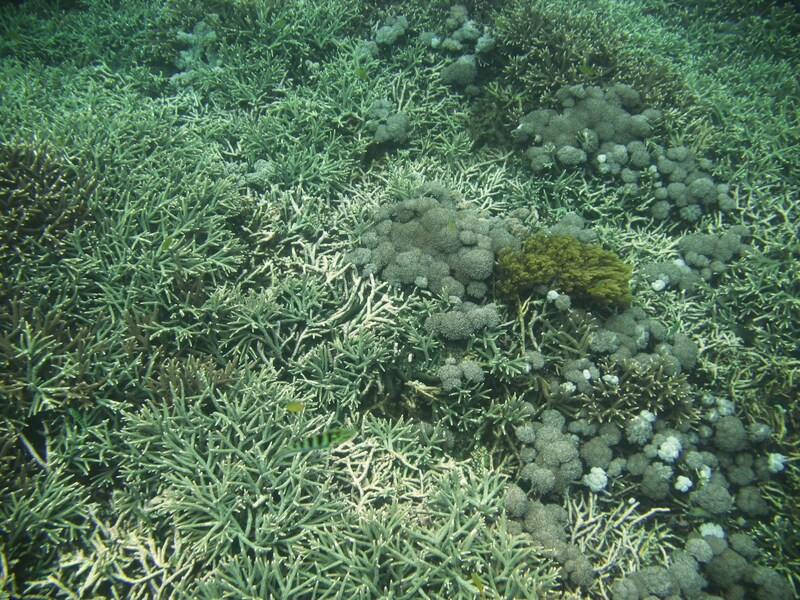 This place was really crowded, though, and we could observe that many corals were damaged and broken off. We strongly feel that these areas deserve a much more strict protection against tourism and other human activities: this level of impact is just too much for the ecosystem. Fortunately, some parts were unimpacted and these were really stunning! In our next blog post, we will focus on other aspects of Bali’s natural environment and the man-made impact that threatens it. The Great White and beyond: Hermanus and Gansbaai, South Africa. 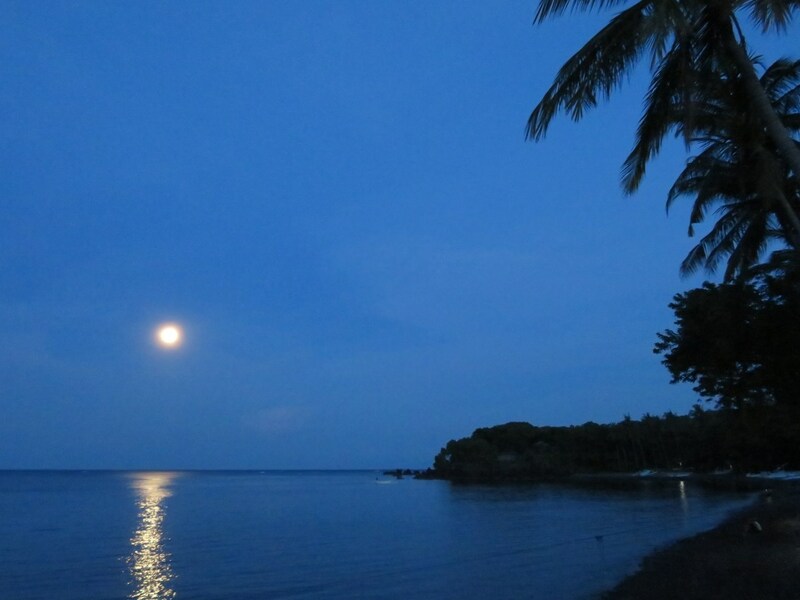 Beyond the crowded beaches – an account of Bali’s exceptional cultural identity.